Looking to install a new shower or wet room into your home? Get our ultimate buyer's guide on KUDOS wet rooms. Wet rooms are a great way to add value to your home. They give an air of luxury and indulgence that more traditional showering systems might not. In order to get the most out of your wet room in terms of design and practicality, it is important to choose the right wet room system. KUDOS are the UK's leading designer and manufacturer of shower enclosures and wet room systems. Based in the stunning foothills of the Lake District, KUDOS have a flair for design that reflects the strength and beauty of the landscape that surrounds them. Since 1999, KUDOS have been combining this eye for innovative design with their strength in precision engineering; the result is a carefully crafted range of shower and wet room systems that offer the very best in functionality and value. All KUDOS products are British made and come with a watertight lifetime guarantee. The KUDOS wet room systems use only quality product components, including their SmartSeal technology and click-to-lock hinges which ensure that all of their wet room products are approved for high-powered showers and carry a lifetime guarantee. KUDOS also use the permanent protection system LifeShield on all their glass as standard. LifeShield-protected glass resists dirt and limescale and offers lifetime glass protection. KUDOS wet rooms offer the very best in design, technology and innovation and are available through two collections, Ultimate2 and aqua4ma. KUDOS' exclusive ultimate2 wet room system combines sleek design versatility with impressive levels of performance. The ultimate2 system provides complete versatility and flexibility when it comes to shape, giving you the freedom to lay out your wet room exactly as you would like. Choose from a range of quality products and create a luxurious yet adaptable space that suits your home and gives your bathroom that bespoke touch. The ulitmate2 system shower panels use crystal glass-to-glass SmartSeal Technology to provide a seamless, elegant look for your newly designed bathroom. This technology also makes cleaning your shower panel much easier as it is more difficult for dirt to adhere to than simple glass panels. KUDOS ultimate2 shower panels are available in a range of sizes and in flat or quadrant (quarter circle) curved alternatives. These flexible options offer you the opportunity to make the most of your available bathroom space and will fit into any recess to create a perfect bathroom design. Ultimate2 shower panels can be used in small spaces that other systems may not accommodate and in larger rooms where shower space can afford to be more generous. Quadrant panels are particularly suited to smaller rooms enabling an empty corner to be utilised, whereas straight panels are perfect for enclosures that need to be parallel with a wall. Ideally, you should choose and position shower panels so that they allow ample space to enjoy your new shower area, these choices, however, need to be balanced with the available space in your wet room and the overall design look that you are going for. KUDOS ultimate2 shower panels can be fitted to a shower tray or directly to a tiled floor for an elegant and seamless finish to your wet room. The resulting harmonious look of a floor-fitted shower panel adds sophistication to a larger bathroom and the illusion of space to a smaller one. For the ultimate in elegance, you should design your bathroom so that you walk round your shower panel into the shower without requiring a door. This, however, is often not possible due to space restriction. This is not a problem because if your wet room design requires door opening, KUDOS ultimate2 offer an impressive range of options to suit all tastes and design requirements. Available door mechanisms include those with hinged, bi-fold and sliding operations. Sliding doors offer the most economy of space and, being ideal for wider openings, are a popular choice for both curved and straight panels. Bi-fold doors are often a practical choice as they require less opening space than hinged doors whereas hinged doors need a larger opening space but still retain some of the transparent look of sliding doors. Frames can be ordered in the traditional silver or in a range of contrasting finishes as special orders so you can match your shower enclosure to any of the colurs below. Shower panels can also be combined with hinged deflector panels for added convenience and to protect your bathroom space. These panels are optional but repel shower overspray and are recommended for more open designs. 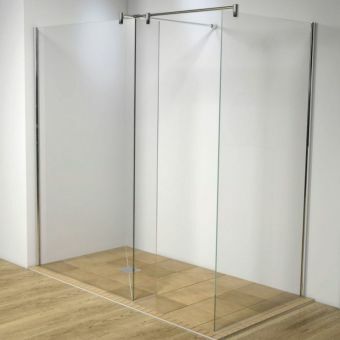 All ultimate2 shower panels and deflector panels, including curved shower panels, use 8mm safety glass as standard but a 10mm option is available for deflector panels. Should you find post-installation that your design results in external splashing, a deflector panel can be fitted retrospectively. A collection of unique finishings is also available to complement the sophistication of the ultimate2 shower panels. The final look and feel of your bathroom space can be coordinated using your choice of standard silver or special colour furnishings. 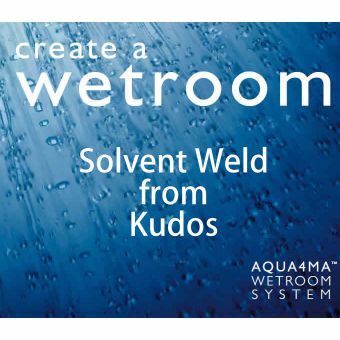 Carving out a reputation for their high quality, versatile shower and wetroom products, Kudos are one of the leading names when it comes to reliable components. Every shower space needs a solid foundation, and there are none more suited to the task than those presented by Kudos. 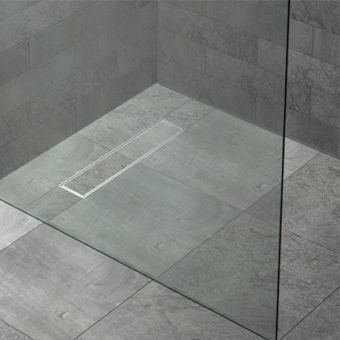 The Kudos Aqua4ma range of wetroom shower bases provide the perfect substrate for a tiled wetroom interior, integrating a level floor panel and waste outlet. Creating a watertight seal is also essential, which is where the Aqua4ma skirting packs and solvent weld products come in. Used by professionals for shower installations in homes, hotels and guest houses, they are the go to name when it comes to shower enclosure or wetroom creation. 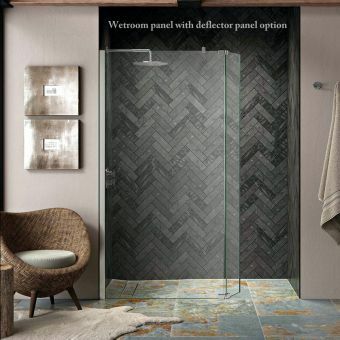 Kudos Wetroom panels come in a range of thicknesses, and are created with tongue and groove fitting mechanisms to allow ease of installation and ensure a strong, watertight seal when bonded. As well as taking the time to consider the immediately visible design aspects of your wet room, it is also important to choose carefully when it comes to the floor mechanics and plumbing of your system. Poor choices and cutting corners can lead to disappointing results over time. Good design in the floor and drainage is as vital as it is in the panels and external fittings. Most wet room systems use a tray former which creates a gradient for waste water to flow down and a floor gully which is the outlet through which the waste water travels to the drain. Choosing these can be complicated and require technical help. The KUDOS aqua4MA collection is an easy-to-fit modular system which can be used to create the ultimate wet room. The auqu4MA system can be easily fitted to any shape bathroom. Being modular, the KUDOS aqua4MA takes the guesswork out of design and is easier to fit than other separate systems. Despite its ease of installation, the auqua4MA wet room system is fully flexible and can be used with a wide range of shower sizes and panel options. The aqua4MA is supplied in two formats for a linear drain or a central drain. Both styles feature delightful stainless steel waste covers with the linear type able to accomodate tiling to match your flooring so that it almost disappears, a masterstroke from Kudos. Perhaps one of the biggest worries about wet rooms is the possibility that they might leak. Because aqua4MA is a modular system with components that are designed to work together, it is a high-performance option that has been designed to work for life. Wet room installation and maintenance are both key factors in ongoing performance and the aqua4MA system is easy to both fit and maintain because its components have been designed to work together. The aqua4MA wet room system is a high-functioning system that can be used with tiled floors in a seamless and stylish manner. 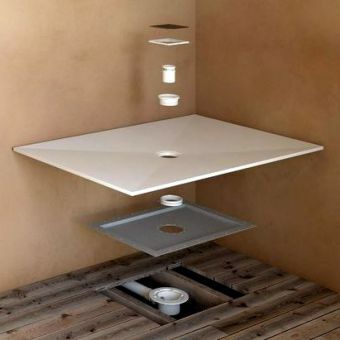 It consists of a metal under-tray and a plastic covering shower base. Together, these make a watertight seal which ensures that your bathroom's tiles, floorboards and fixtures are protected from water damage. The tray can be trimmed to fit your available space and design requirements, allowing you to be flexible and achieve the design that you really want. The aqua4MA wet room system is suitable for most floor types and can be safely installed around existing floor beam arrangements and tiles. 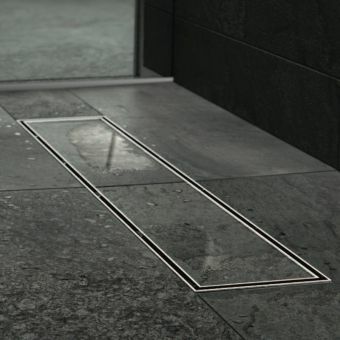 The aqua4MA floor gully has a unique design which allows it to be connected to your water drainage system at any angle. This gives increased flexibility when it comes to the design of your wet room because you will not be constrained by the position of your waste water pipes. In order to ensure a watertight seal around your wall, it is recommended that you also install aqua4MA skirting panels. These panels can be screwed to the wall and fit together with a watertight tongue and groove connection. They fit along the top of the shower base and should be sealed with a solvent weld for optimum protection and assurance against leaks. 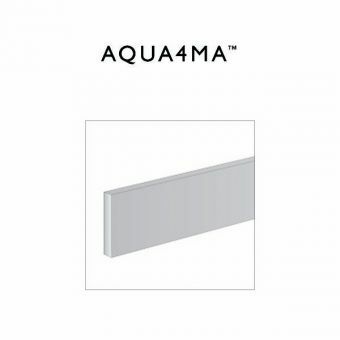 Aqua4MA wet room panels are the perfect accessory to your aqua4MA wet room system. They can be installed on the floor where they are even suitable for heated floor systems, and on walls. The aqua4MA panels are suitable for use with larger tiles or more intricate mosaic designs on both walls and floors. In both cases, aqua4MA wet room panels create a watertight seal that will protect your wet room and keep it as beautiful as the day it was installed. 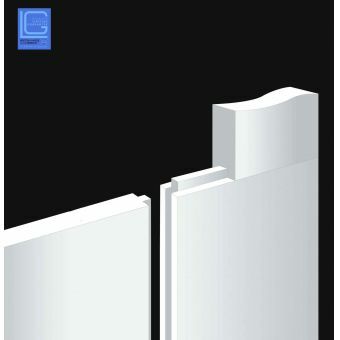 Aqua4MA panels can be used for a number of purposes including shelving and decorative panels. Whilst the KUDOS wet room system does offer you the opportunity to select individual panel, underfloor, door and fittings to create a bespoke wet room for your bathroom design, it is also available in a selection of complete packages. Not everybody wants a hand in every minute detail of their bathroom design. The opportunity to purchase a complete and guaranteed wet room system package might be exactly what you are looking for. It takes away the need to search for complicated, compatible items whilst still leaving some design choices, e.g. size of wet room area, shower choice and tile choice in your hands. Whether you design your KUDOS wet room from scratch using the ultimate2 and aqua4MA range of products or take advantage of one of our KUDOS packages, you are guaranteed to be pleased with the sleek and sophisticated results. If you need help choosing the perfect wet room system, we have specialists available to help. Give our specialist team a call on 01765 694 720 for FREE impartial advice.